After a year of waiting, the time had finally come to make the annual pilgrimage to one of my favorite places in the state – Tam McArthur Rim in the Three Sisters Wilderness. 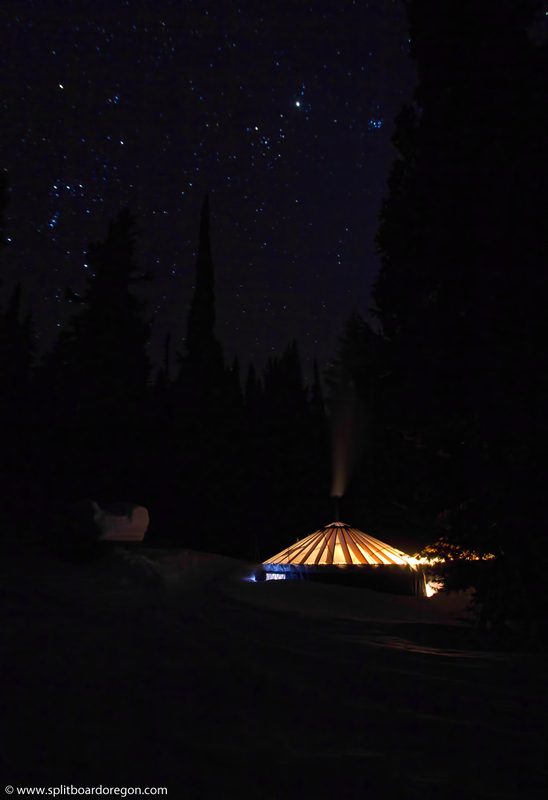 Like years past, we stayed in the cozy huts operated by Three Sisters Backcounry, Inc. This year’s crew consisted of myself, Todd, Andy and Joe. For Todd and I, this would make our fourth trip in four years to the huts, and it’s with good reason that we keep coming back! Andy came over the night before departure day and crashed at my house, while Joe met both of us around 6:00 in the morning on Sunday. After briefly going through our gear and food, we managed to fit everything in my Subaru and hit the road by 6:15, heading east on Highway 20. Within a couple of hours, we arrived in Sisters for a pit stop at Ray’s and grabbed a quick breakfast and a few miscellaneous items (Tabasco for the salmon chowder), etc. Driving south from Sisters towards Upper Three Creeks Lake snowpark, it was surprising to see the landscape after the fire which had ripped through the area the previous summer. One thing that was immediately apparent was the increased views of the North and Middle Sisters, which were quite pleasurable. 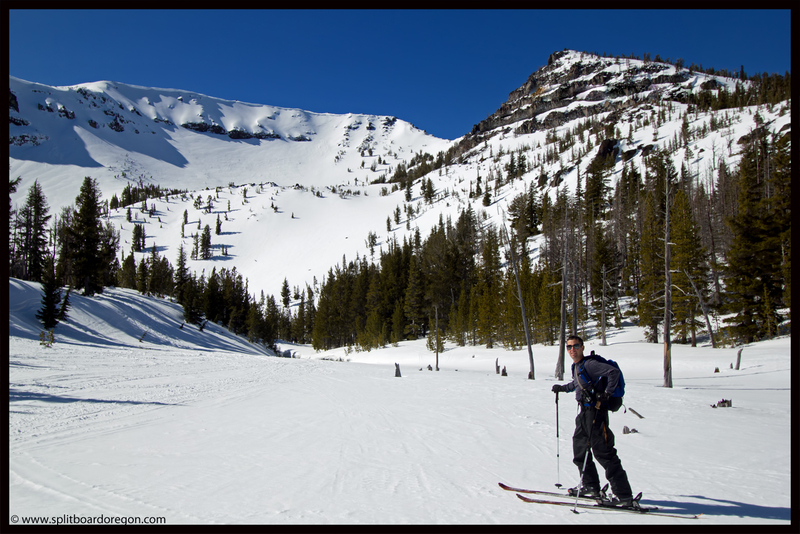 At the parking area, we met Todd and shuttled our gear up to the waiting snowmo’s . After the unceremonious signing of the waiver forms, we started packing our gear into the sled trailers in preparation for the 6 mile shuttle to the huts. 8 others, some of the same crew from last year, would be heading in with us and occupying the other hut. 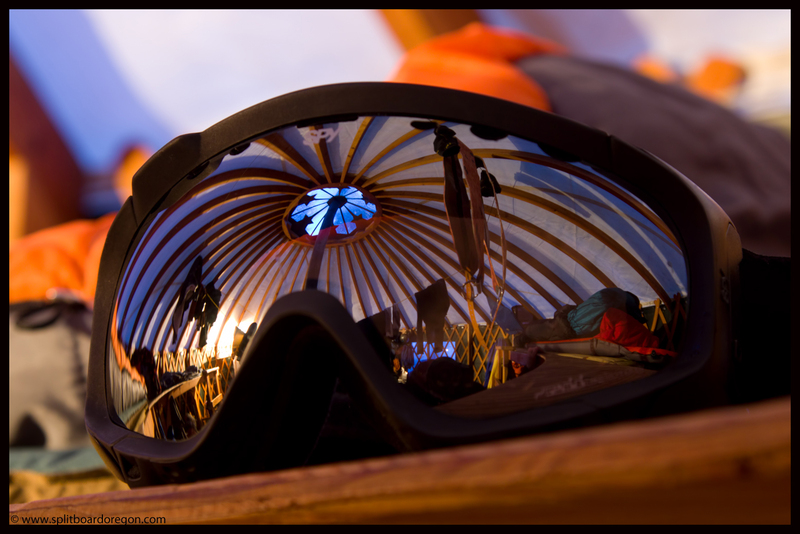 Once the gear was tied down, we headed out and made quick time to the huts. 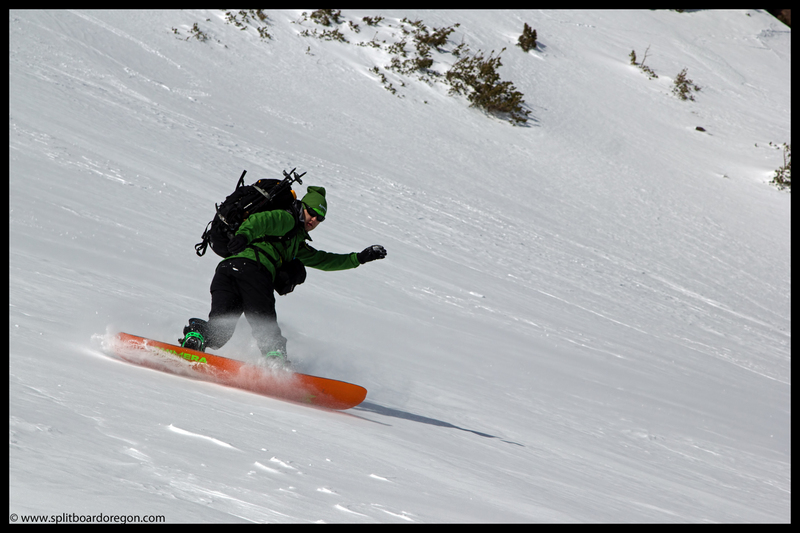 As usual, nobody wanted to linger too long on the first day, so once the gear was sorted and bunks claimed, we took Shane’s advice and headed out for some of the only south facing terrain in the area looking for some corn snow. With the last few steps to the top I knew the view was going to be rewarding, and sure enough, looking west to the Three Sisters didn’t disappoint. The lines on South Sister’s east side reminded me I need to get back in and pay the Green Lakes area another visit, while both the Middle and North Sisters beckoned for return visits as well. After a quick snack, it was time to head down for the first of several runs. The snow had softened somewhat, but the crust layer beneath what had softened was a bit inconsistent, making for spicy turns. Several runs followed, with the snow staying nice until about 3:00 before it started to refreeze. Skinning back to the huts went quickly, and “skiing” down to the lake in refreezing snow conditions on the split is always a challenge. A celebratory beer was in order, if not for the skiing then for the fact that we didn’t have to drive home and we had a warm sauna waiting for us after dinner. Joe cooked up some pasta with an excellent meat sauce that was prepared at home and it hit the spot! Before getting too cozy in the huts, I hiked out to the lake to take a few photos with the camera and tripod, but didn’t have any moonlight to work with. Not wanting to wait long enough to get any star trails, I snapped a few shots of the huts glowing in the darkness…. After the photo shoot, it was time for the sauna and a favorite mixed drink of Vodka, Crystal Light lemonade, and snow. Todd had the sauna blazing, and after 30 minutes I felt refreshed and retired to the hut for the evening. Reading by headlamp at the huts is something I look forward to all year long. Mostly, just being away from the computer, television and cell phone is what I need to recharge and fully relax. This year’s reading material consisted of Off Piste Mag, The Avalanche Review, and Bugle Magazine. Sleep didn’t come too easy that night, mostly due to the other group carrying on, but it did come and we awoke in the morning ready for a long tour. Day two started out with a breakfast designed for an energetic day, and consisted of oatmeal and coffee. 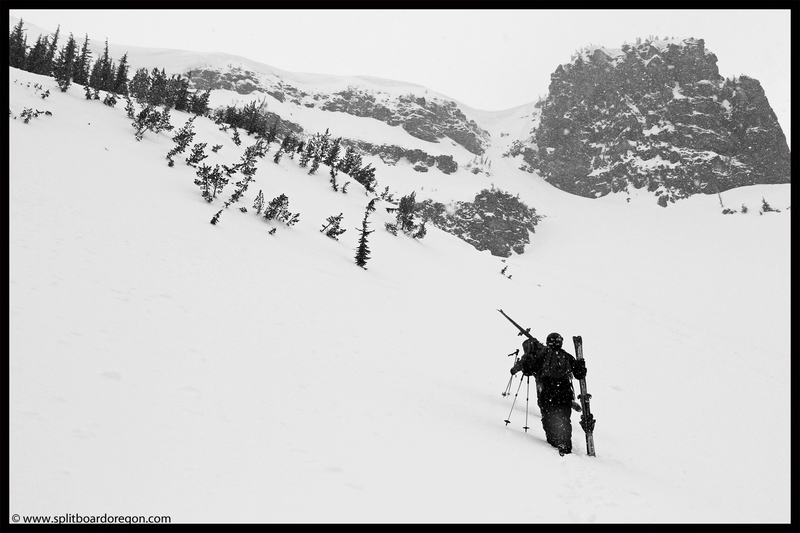 After breakfast, sandwiches were made for a mobile lunch, gear was packed, skins were donned and we headed out. 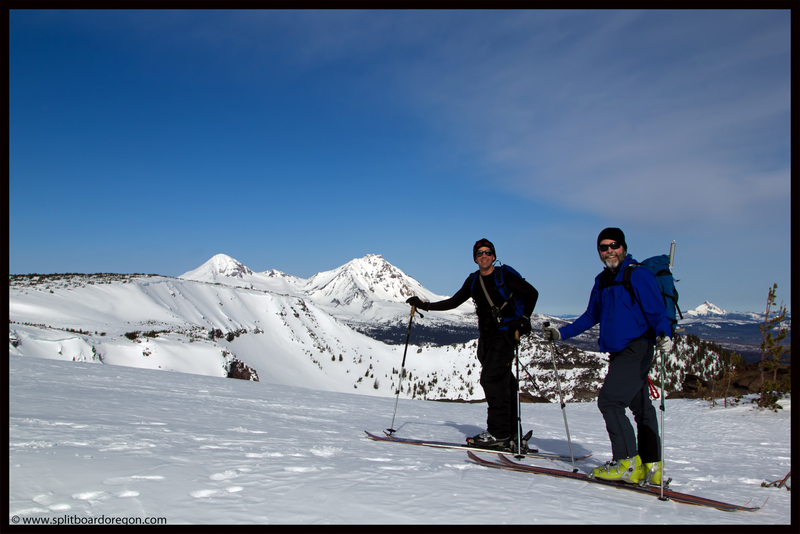 The plan was to ski to Broken Hand and possibly Broken Top, and before long we reached the top of the rim. The view from the Prow is always worth capturing with the camera…. The weather was beautifully sunny, affording excellent views in all directions, but the winds were a bit intense at times, keeping us from staying put too long in any one spot. Cruising out the long flat towards Broken Hand in the windy conditions put a smile on my face, not only because I was going to a spot I’d always wanted to visit in winter, but just because it was winter and nice to be out in the elements. 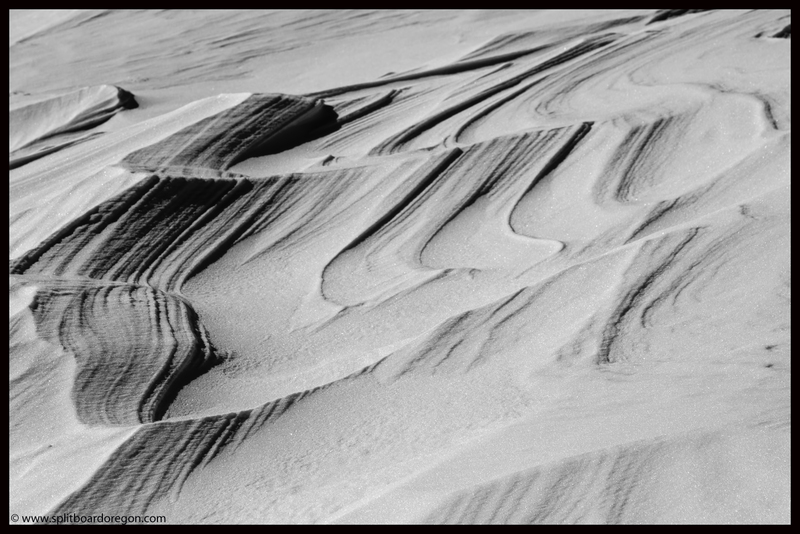 On the way out, the wind was sculpting some interesting formations in the snow, and I snapped a few photos of what could have passed for mini sand dunes if a person didn’t know better…. Further out the ridge, I’d had my eye on Ball Butte, which from the north looked like a mini Mt Bachelor. Though the vertical was short, I’d never really paid attention to the lines on the north and northeast side of the mountain, having only been up close to the butte from the west. Making a mental note that the hill might warrant a visit at a later date, we skinned on. Andy and I had dropped behind, having made a couple of phone calls from the top, and Joe and Todd looked like tiny ants out in the distance as they neared Broken Hand. Looking back to the west and north, the views were spectacular with all the volcanoes lining up in a row. 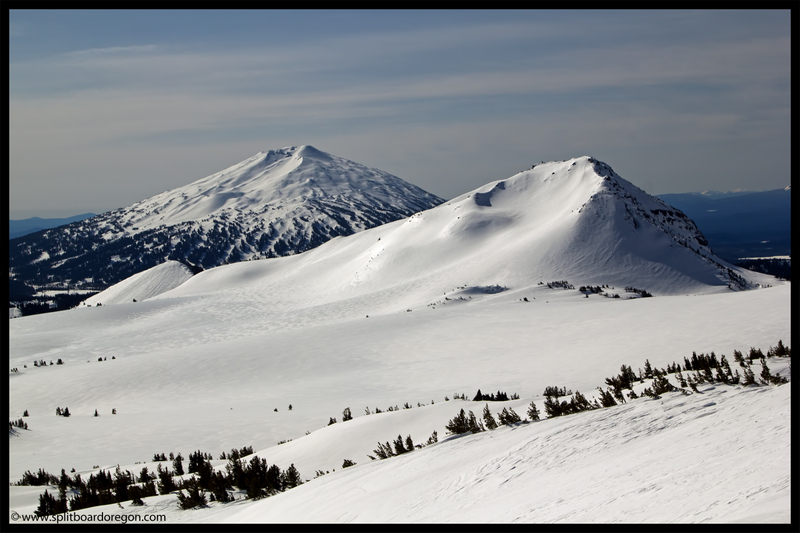 Visible from south to north were Diamond Peak, Mt Bachelor, Broken Top, South Sister, Middle Sister, North Sister, Mt Washington, Three Fingered Jack, Mt Jefferson, Mt Hood and Mt Adams. 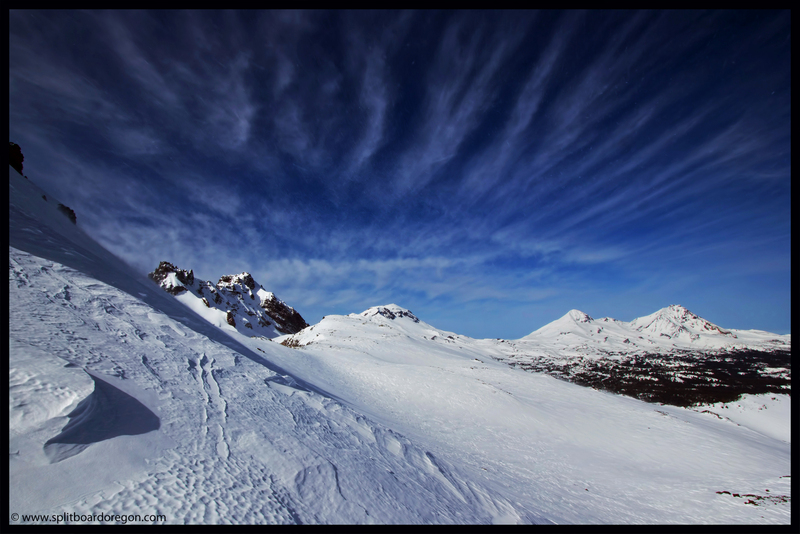 The blue sky contrasting against the white snow made for a good opportunity for a panoramic shot…. By 11:30 we reached Broken Hand and stepped out of our ski gear, assessing options for a descent. Going further didn’t look like it would produce much in the way of good skiing, but would probably provide excellent views. 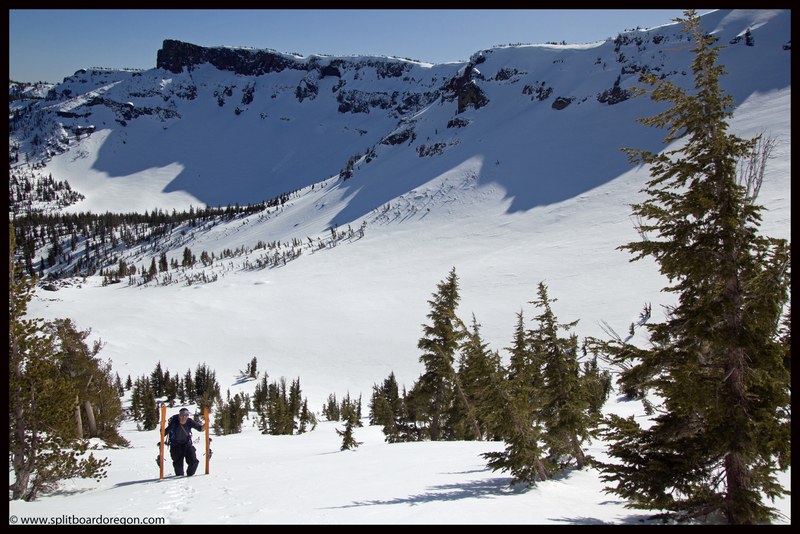 With the wind whipping across the ridge, we didn’t linger long before deciding to drop the east facing slope on Broken Hand to then ski over towards Broken Top. With the wind, it looked like the east slopes may have a few inches of fresh snow. Stability wasn’t a concern given the bomb proof conditions, if we were to get fresh snow today, the east slope might be our best bet. 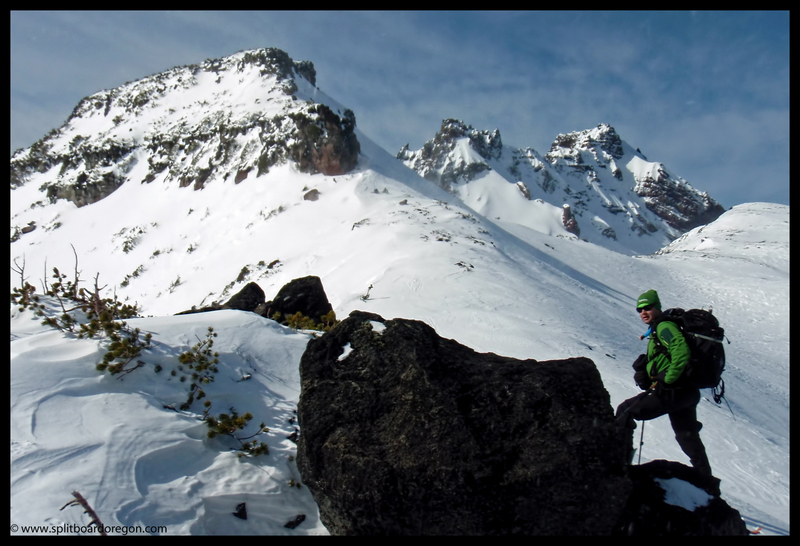 The photo below of Broken Top was taken from the ridge top, while the second photo shows the east side lines on Broken Hand. Joe dropped in first, and I could tell the turns were decent but not quite as deep as we were hoping. The first few turns were ok, but the familiar scratching sound of hard crust took over after a hundred feet or so. Andy and Todd dropped next, and Andy traversed out towards the left trying to find better snow. 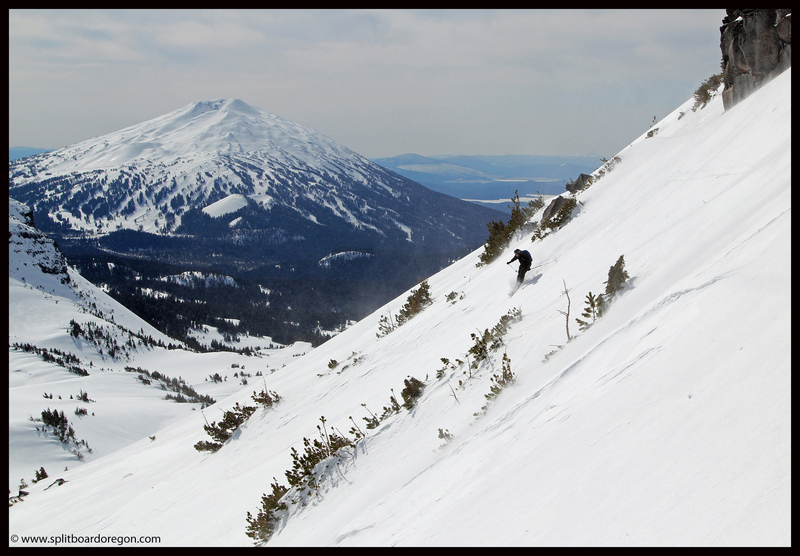 I snapped a few photos of him making turns with Mt Bachelor in the background…. Several hundred feet below, Andy, Todd and Joe waited while I made turns in the sunshine and caught up with them. At the bottom, we hiked over towards Broken Top and drooled over the lines on the mountain’s north side. Given the firm snow conditions, the others weren’t interested in skiing the lines, and it took every ounce of restraint I had to not try and convince them to change their minds. 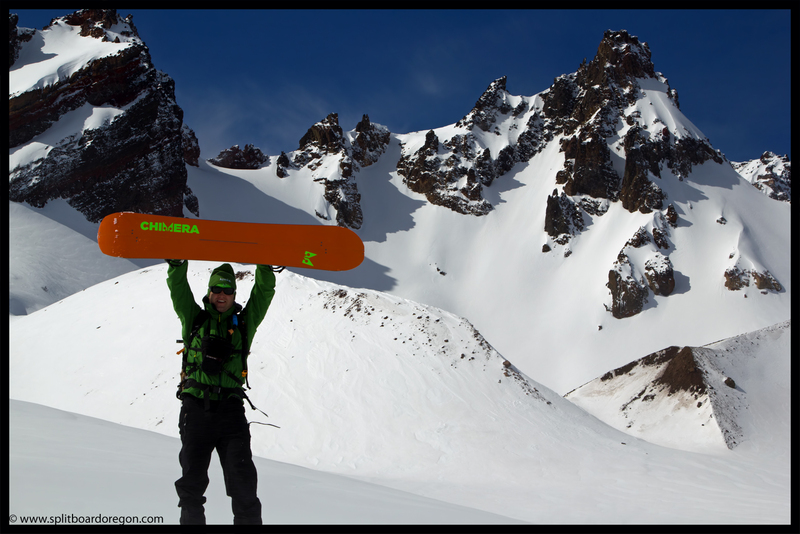 This area is definitely on the bucket list for a return trip, with worthy lines all over the mountain…. After lunching at a nice spot on the south side of Broken Hand out of the wind, we booted up and made another long lap on the Hand’s east flank. Staying to the rider’s left actually yielded some consistent wind transported snow. Once the fun was had on the second lap, it was time to head back towards the Rim and make a few more turns before calling it a day. On the skin back, I pulled out the smart phone and was able to check the weather forecast. Things were looking a bit more promising for the next couple of days. 2-4 inches of snow on Tuesday, followed by 2-4 on Tuesday night and 3-5 on Wednesday. Little did we know we’d do even better than that! To celebrate we took a pull off the flask of whiskey I’d been carrying around in my pack all day! In the rim, we made short work of the surprisingly good snow in the Playground, before settling in for the evening at the huts. Dinner for the night was on me, and I cooked up an excellent salmon chowder with vacuum sealed salmon caught from the Alsea River in the late Fall. The Tabasco, purchased from Ray’s earlier in the trip, was the finishing touch to what was an excellent meal! Once dinner was finished, the beers were cracked and it was sauna time, which was perfect for the tired muscles. Given the long day and the calming effects of the sauna, it didn’t take long for us to his the sack and soon everyone was asleep dreaming of more turns the following day. Day three dawned clear and cold, in contrast to the cloudy skies we were hoping to see. After a hearty breakfast of ham and egg sandwiches and yogurt, we donned skins with the idea of checking out the main bowls in the Rim. Once we got into the main bowl we could see weather moving in from the west, the first signs of the powder that was to come. 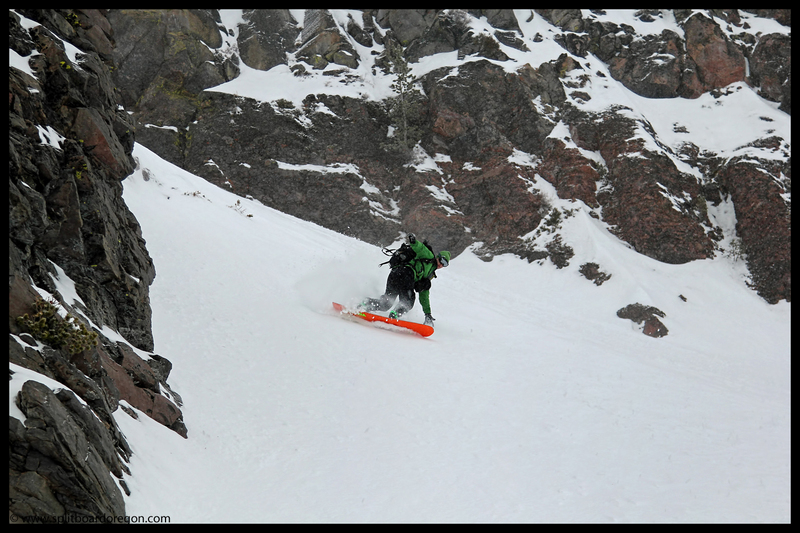 Our first lap consisted of wind buffed pow over a crust on the east side of the bowl. Heading up for lap 2, Andy and I elected to hike towards the base of the prow and check things out. A large avalanche, which had run down the middle of the bowl a week earlier, impeded our progress, and we had to switch from skins to booting. A few hundred feet below the top of the Rim, I dropped in for an excellent run. 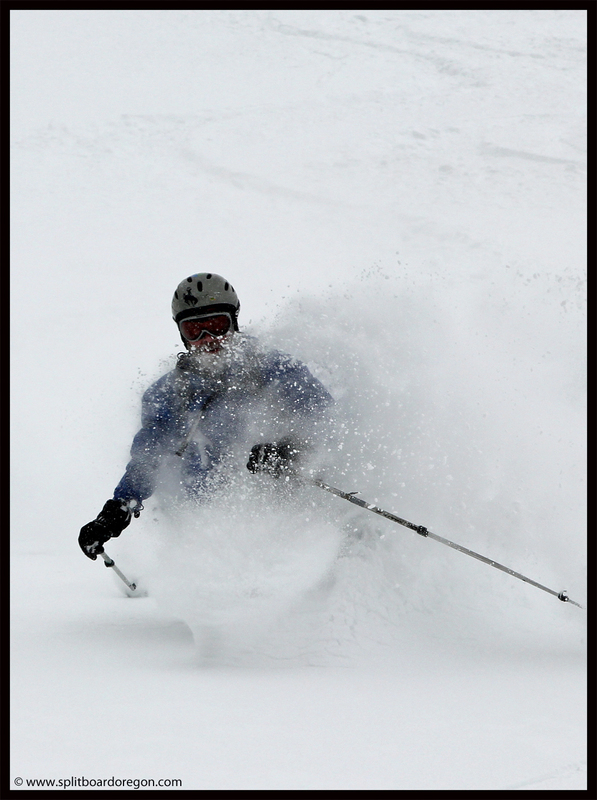 The snow was well preserved and I was rewarded with nice pow turns for my efforts. At the bottom, I convinced the rest of the crew to head backup for one more lap. Near the top, I hiked to the base of a nasty couloir directly below the prow, while Joe, Todd and Andy waited below me. The hiking was steep and difficult for the small amount of additional vertical gained, but it was well worth it. Standing at the high point directly beneath the Prow was pretty awesome, and looking up at the rock formations was a highlight to me for sure. I yelled down to Andy that I was dropping (he had my camera), and dropped in for my best run of the trip to date. 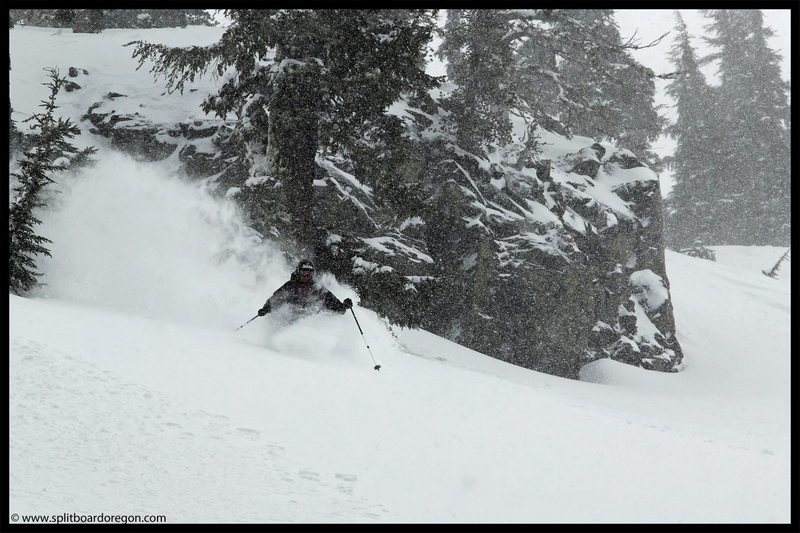 The snow was perfect – stable and wind packed powder. Walking out towards the lake a bit later, 4 to 5 inches of fresh snow had fallen, and conditions were shaping up quite nicely for our final day of turns. An added bonus was that the fresh snow made my vodka snow slushy taste that much better that evening! The next morning, we were up extra early, given that we needed to leave by 2:30 pm and wanted to maximize our time playing in the powder. Todd fried up the last of the bacon, and in combination with my oatmeal, breakfast gave me plenty of energy for the day. On the skin track outside the huts we could tell it was going to be a good day, with about 8 inches of new snow. As we skinned higher through the trees, it felt like a full on return to winter with snow falling heavily and the wind blowing snow sideways. Upon reaching the top of the rim, skins were ripped quickly and we dropped into the mellow bowl one by one with Todd leading the way. 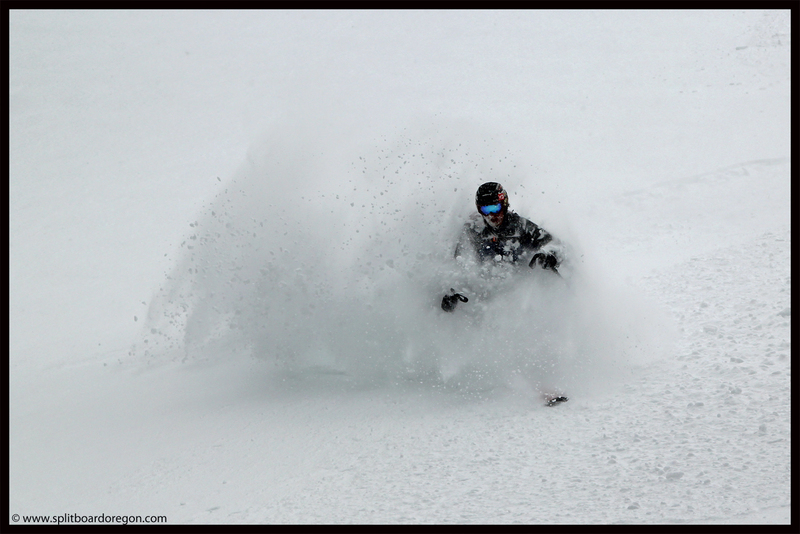 As I dropped in and turned heelside, the familiar feel of cold smoke faceshots put a smile on my face. 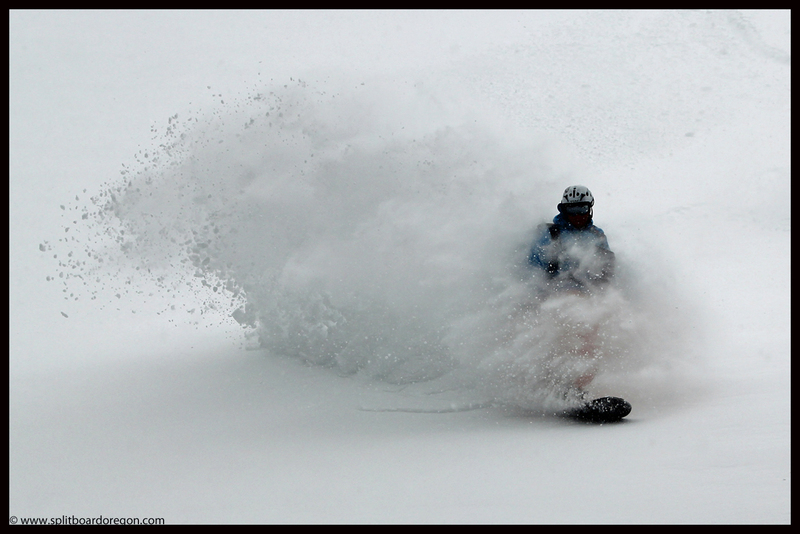 Andy enjoying the fresh pow! After high fives at the bottom of the run, we headed back up for another lap before venturing out to the Playground bowls to check out conditions. More powder followed, though we had to share with the group from the other hut since they’d followed our skin track up later in the morning. Skinning out to the Playground area was a different story however, as nobody was around. The bowls looked to be loaded up, and before dropping, we elected to do a ski cut, practically knowing what would result. Sure enough, the main area in the bowl fractured and a soft slab of 4-8 inches ran a few hundred feet down the slope. 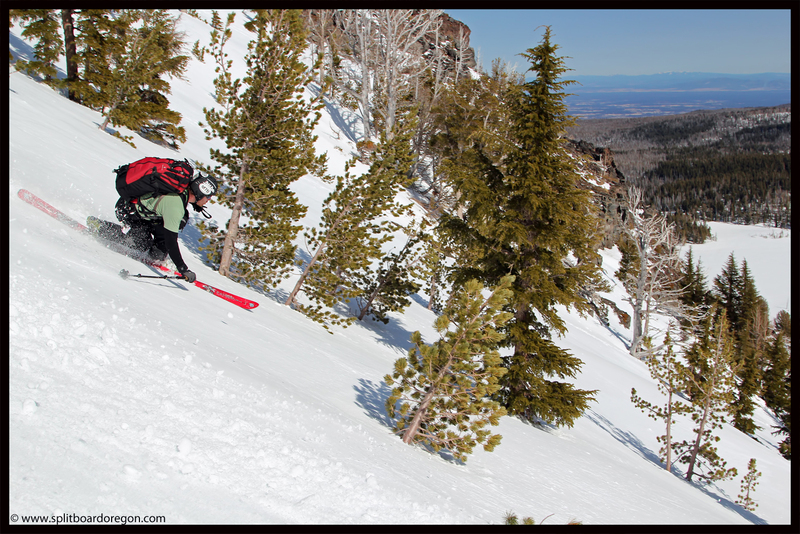 Not to worry, we skied down the ridge a few hundred feet to a point where the slope angle lessened from 35 to 30 degrees, dropped in, and had an epic run. We made several more quick laps in the Playground on the half hour, which was about the time it took to drop in, make turns, and skin back up. Winter was definitely back in full force, as evidenced by some wind gusts that nearly blew me up the hill without even having to skin. In addition to the Playground, we checked out a few of the gladed areas to the east and found excellent powder conditions there as well. All told I think we made seven runs on the day before heading down at 1:30 to get our gear in order for the sled ride out. One unique aspect of this trip was the fact that not only did we get to see quite a bit of new and interesting terrain in the area due to the early high pressure, but the snow conditions ran the gamut from corn snow to powder. 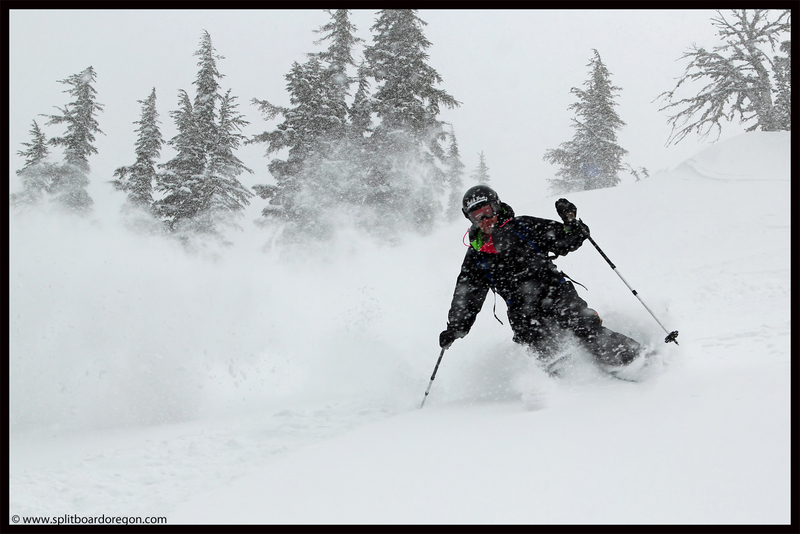 And, for the fourth year in a row, we scored epic powder at the huts when early on in the trip it looked like we may get shut out……. Back at the huts, we were able to enjoy the wood stove and get a few things dried out since there wasn’t another group coming in until the following day. After bartering for the first ride out since we had a longer drive back to the valley than the other group from Bend, we ended up leaving with Jonas at 2:30 but parted with an 18 pack of Rolling Rock beer for $7 to secure the deal. On the sled ride out, Jonas took two trailers and secured them together, which made for a heavy ride. The sled however, made short work of the road out, and both Joe and I were getting face shots while riding mush on the back sled. 25 minutes later, gear was being unloaded in the snow park and this year’s trip was coming to an end, but will go down as one of the best trip to Tam to date! 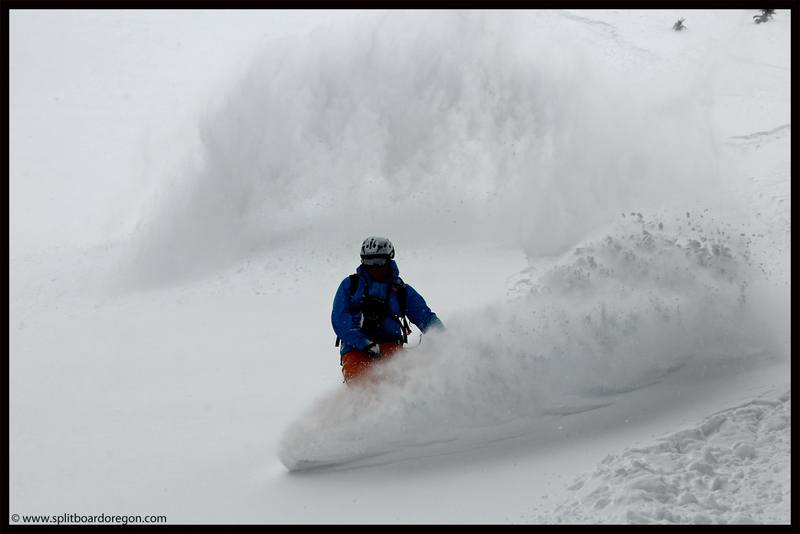 Reservations for next year’s trip are already on the books, and I can’t wait to get back to the Rim for what will hopefully be some more epic powder turns!